Last week Luke and I attended UX Australia—our annual pilgrimage where we connect with the wider UX community to get educated and inspired about all things UX (and, let’s be honest, chat and drink beer with friends, old and new). While we didn’t re-enact last year’s UX Brothers cabaret act, we were still pretty involved with the conference this year, teaching workshops, hosting panels, and running hands-on sessions. And in a nod to our performance from last year, we still opted to don our trademark black hats. I ran my Sketchnoting 101 course on Wednesday before the conference, and was delighted that there was so much interest in visual thinking and visual note-taking. The class created some remarkable sketches in what was an ambitious time-frame, and I was very proud of all the people sketching the conference presentations in the days that followed! This year we partnered with the conference organisers to create a deck of illustrated trading cards, each describing a different UX technique. Each attendee received a pack of the same card, and was encouraged to swap with other conference goers in order to complete the set. On Thursday we ran another careers panel, which proved very popular, and the talented Rebecca Jackson once again captured the panel with stunning visuals. Unsurprisingly, lots of people are interested in learning about UX careers, salaries, how and when to go freelance, how to find a recruiter, what to put in a portfolio, and more. If you’re in Melbourne and interested in this stuff but didn’t get to attend the conference, we’ll be running another panel at UX Australia Redux in October. On the final day, Luke ran a session on graphic facilitation, and the room was packed beyond capacity (some people elected to sit down the sides, rather than miss out). The group activity resulted in some stunning communication artefacts, and this is definitely a topic we’ll be exploring further on UX Mastery. 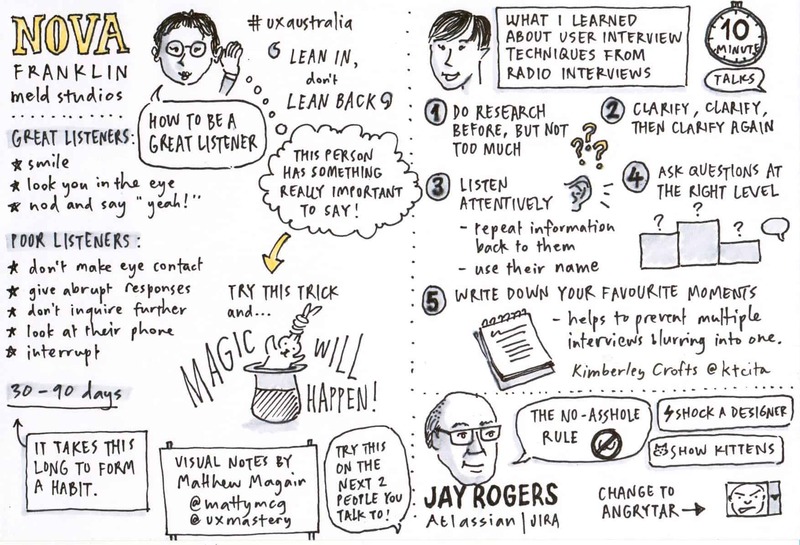 The UX Australia 2014 conference was bigger and better than previous years. It was great to meet so many new folks from Australia and overseas, and to reconnect with old friends I sometimes see only once a year. A huge thank you to the UX Australia team for putting on a great show! If you haven’t attended UX Australia before, set aside 25-28 August, 2015 for UX Australia 2015, in sunny Brisbane. I look forward to seeing you there! It was lovely to meet you guys in person! The trading cards were so much fun and worked really well as an icebreaker. The UX Careers panel was really useful because we got to hear from a recruiter, a freelancer, a hiring manager (and of course you guys) and they all had different views based on what they do. It allowed us to see what our options are across different facets of the industry and introduced me to things I hadn’t considered such as freelancing. Thanks Ash, it was great to meet you, although our conversation was too short! :) Glad you enjoyed the panel. So lovely to see both of you and love your sketchnotes as always! Trading cards were great too. I’m short one card but maybe there’ll be a chance to find it in future events. Glad we could help Ruth!